We are back for our 2nd annual holiday concert and if you remember last year, well, it was a party in there. 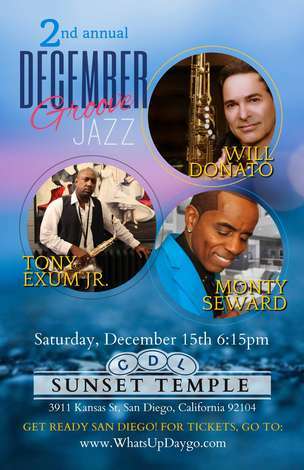 This Mediterranean's Jazz and Supper will team up with The Sunset Temple of North Park to host this amazing Holiday Smooth Jazz Concert. There will be limited Valet parking across the street from the venue and parking will be available inside the large parking garage across from Observatory.